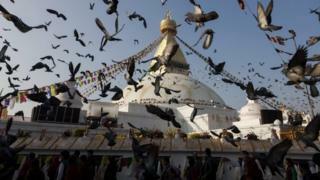 Nepal has reopened one of its most famous monuments, the Boudhanath Stupa, to the public after it was left with deep cracks during the 2015 earthquake. The white-domed structure in Kathmandu was covered in prayer flags and flowers as monks chanted prayers and burned incense to mark the event. The prime minister described it as a proud moment for Nepal. More than 8,000 people were killed by the quake and ensuing aftershocks, causing widespread destruction. Restoration work on the stupa began in May 2015, has cost $2.1m (£1.70m) and included more than 30kg (66lb) of gold, according to the Boudhanath Area Development Committee. The stupa was repaired without government funding - the money instead coming from private donations from Buddhist groups and help from volunteers. The government for its part has been strongly criticised for the slow pace of reconstruction and for the fact that many quake-damaged temples and monasteries remain unrepaired. But Prime Minister Pushpa Kamal Dahal was not going to let the criticism interfere with Tuesday's celebrations. "This is a proud moment for us," he said after traversing the steps of the newly-painted stupa. "The successful reconstruction of Boudhanath is an inspiration for what we have to achieve in quake-affected areas." Nepal has reopened many heritage sites in the Kathmandu valley to the public in a bid to attract tourists after the devastating earthquake of April 2015. Among them was Kathmandu's historic Durbar Square, or "noble court", which was badly damaged. Shortly after the quake, Unesco's director-general Irina Bokova described damage to the Kathmandu valley as "extensive and irreversible".